I don't care what "they" say, that is nowhere near intuitive. Anyway, here is the zircon, Bancroft, ONT. How do I copy onto my mouse clipboard the BB code and paste? I don't see anything that says mouse clipboard. Right click, left click, what? Keyboard keystrokes for copy and past are as follows. Highlight the text you wish to copy. On Windows, Ctrl+C is copy, Ctrl+V is paste. On a Mac, Command+C is copy, Command+V is paste. ETA: I see you got it...I didn't read ahead in the thread. I'll leave this just in case someone else might need it. I've got pictures of zircon, I now have some on Flickr, but i can't find how to get them here! Around here, they seem to mostly be in radioactive zones. Anyplace explored for radioactives (or old mines) seems to be a high potential spot. Same for smokey quartz. Was just watching your video and remembered a guy telling me about he used to surface hunt Zircons at night with an ultraviolet light. Zircons fluoresce yellow under ultraviolet illumination. Ontario zircons are invariably opaque. Heating an opaque zircon will not make it transparent. 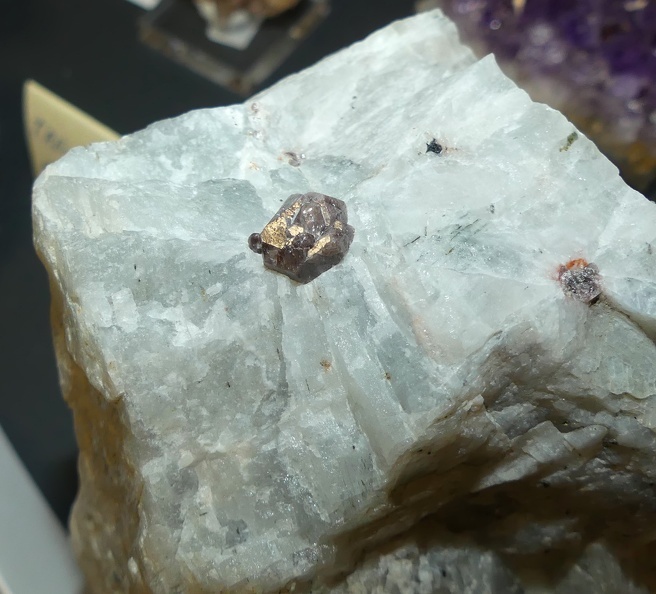 Try hunting at the few mines that have produced transparent zircon, but be prepared to move a great deal of rock with little success, they're not common.